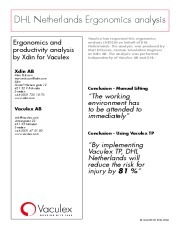 Vaculex VL is an ergonomic lifting solution for industry. It can lift multiple objects at once, rotate the load, tilt sideways and much more. Vaculex VL’s modular design can be customized to lift almost anything up to 250 kg − for example boxes, sacks, bags, windows, metal sheets, stone slabs, drums, barrels, cans, white goods etc. Our solutions have the power to improve your daily operation and the health of your employees. Reducing repetitive strain injuries and sick leave is benefi cial to everyone involved. Please, contact us at info@vaculex.com or visit Vaculex.com for more information.